A perfect Puttanesca for a weeknight. When you're in a bind for ingredients the best place to turn is your pantry. All the ingredients are staples in your pantry that come to together to take the ordinary to extraordinary! Fill a large pot with water. Bring to a rolling boil over high heat. As the water heats, pour the olive oil into a cold skillet and stir in the garlic. Turn heat to medium-low and cook and stir until the garlic is fragrant and begins to turn a golden color, 1 to 2 minutes. Stir in the red pepper flakes, oregano, and anchovies. Cook until anchovies begin to break down, about 2 minutes. Pour tomatoes into skillet, turn heat to medium-high, and bring sauce to a simmer. Use the back of a spoon to break down tomatoes as they cook. Simmer until sauce is reduced and combined, about 10 minutes. Meanwhile, cook the pasta in the boiling water. Drain when still very frim to the bite, about 9 minutes. Reserve 1/2 cup pasta water. 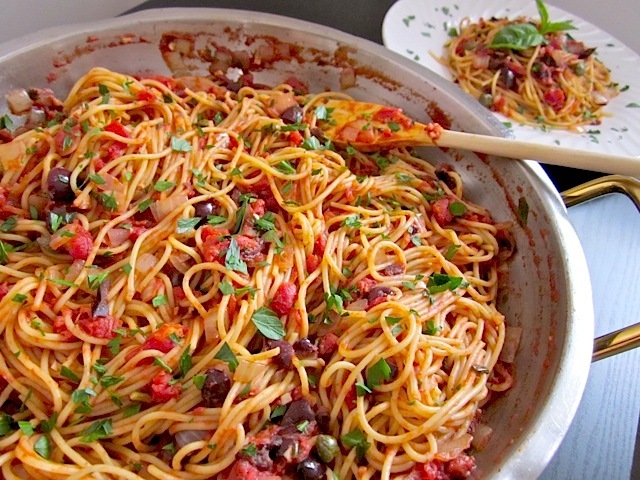 Stir the olives and capers into the sauce; add pasta and toss to combine. Toss pasta in sauce until pasta is cooked through and well coated with sauce, about 1 minute. If sauce becomes too thick, stir in some of the reserved pasta water to thin. You can leave out the anchovies if you like, but for best flavor, leave them in! They add the authentic Italian flavor that defines a Puttanesca.